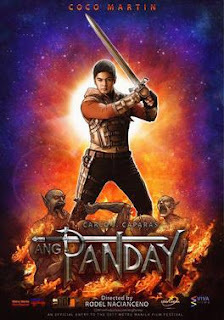 Ang Panday, an original FPJ fantasy action movie featuring Coco Martin, Eddie Garcia, Jake Cuenca and Elisse Joson. Directed by Rodel Naciancano under the CCM Film Productions. Released last December 25, 2017. A modern version of the original story of Flavio (Coco Martin), a gangster and trouble seeker living in Tondo. After a fight incident, he was forced to lived away from troubles adjusted in a comfortable, simple life. Then he meets Maria (Elisse Joson), to whom he fell in love. But fate did not let their love bloom and Lizardo (Jake Cuenca) came to ruin everything with his evil plan as well having an eye to Maria. Then Flavio's journey begins, he discovered his true identity and that he has the of Panday. An action pack film and the kids will surely love. An epic Pinoy fantasy movie that shows that good will always prevails against evil.